A high-ranked Martinique rum with subtle spicy aromas for a very special character, inherited from very traditional craftsmanship knowledge. This expression of HSE is a old rum VO from 4 different origins matured for more than 3 years in oak casks. 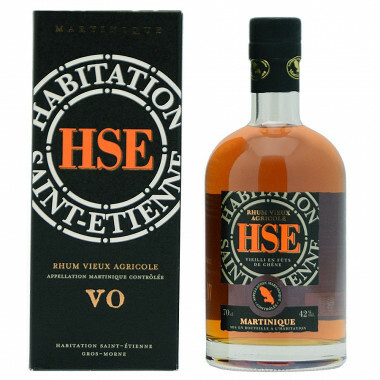 This high-ranked Martinique rum with subtle spicy aromas develops a very special character, inherited from very traditional craftsmanship knowledge. An exquisite creamy style with a deep vanilla fruitiness of stewed fruits, apple compote, banane flambee and caramelised pineapple. Both nose and mouth show stunning balance, a slightly peppery and smoky flavour that creates the "head" of the aromatic spectrum which is completed by beautiful melted vanilla and a Bourbon taste, lifted with a hint of cherry. The Count of Mauny, from the Breton nobility, married the daughter of a planter of Rivière Pilote, South of Martinique and founded his estate in 1749. The plantation is located in a land renowned for its beauty and favourable climate. Pioneer brand of high quality plantation rums, the La Mauny distillery was one of the first on the island to produce agricultural rum. In recent years, Daniel Baudin, Cellar Master and Christian Vergier, consultant oenologist, have been working to refine the quality of the distillery’s old rums. For them, generosity, roundness and aromatic exuberance are at the heart of the La Mauny style. La Mauny rum got its Martinique AOC (Protected Denomination of Origin) in 1996. Nose: sweet and creamy, notes of stewed fruits, roasted nuts, and apple compote. Palate: rich, elegant and lively with appealing flavours of banane flambee, caramelised pineapple. Finish: more tannic with vanilla notes of sandalwood and havana cigar. Silver and bronze medals in 2003 and 2007 at the Concours Général Agricole in Paris. Bronze medal in 2006 at the International Wine and Spirit Competition of London. Silver medal in 2009 at the Concours Mondial de Bruxelles. Gold medal at the General Agriculture Contest in Paris in 2016.